← Another book promo giveaway! In my spiritual life, I think of myself as a philosopher first, and everything else second. The pursuit of knowledge is a deeply important value for me. In that respect, my spirituality can be called humanist, rather than theist. In fact, much to the chagrin of many friends, I’ve reported why I think the worship of the gods is not what matters. The discovery of this proposition was one of the most intellectually liberating moments in my life. And yet I still have a shrine to Herself in my house. And I find myself very reluctant to part with it. Lately, I’ve been wondering why that is. Perhaps I keep it as a show of commitment to my friends and community. Perhaps it’s because I live alone, so the shrine to Herself offers me the feeling that I’m not alone – this feeling might be an illusion, but it seems a comforting one. Perhaps it’s a small concession to Pascal’s Wager: if She does exist, and I ignore her, she’d probably be quite pissed. Or, perhaps I keep it there out of mere nostalgia. But here’s a thought: perhaps I have accidentally discovered what might be called “minimalist religion”. This might be comparable to “minimalist music” of composers like John Adams or Philip Glass, whose music strips away everything down to the point where, if anything else was taken away, it would no longer be music. Similarly, minimalist religion might be the level of religious practice such that, if anything else was taken away, it would no longer be religion. In what does minimalist religion consist? – A receptacle with which you address yourself to the spiritual principle, or in some way enact your relationship with it. (Notice that I do not say ‘worship’.) This receptacle could be an offering bowl for libations, or a candle which can be lit, or a holder for a burning wick of incense, or a sound-maker of some kind (a small bell, a wind chime, etc.). – A written or spoken statement which expresses the significance of the spiritual principle. It might be an expression of gratitude, a request for further blessings, a promise or an oath, a recitation from a sacred text, some poetry or storytelling, a formal or informal prayer, or even simply the uttering of a deity’s name with some show of “faith” or sincerity. Actually, even as I think of it, this third element might be disposable, too. For one could pour wine to Herself, or light a candle to the ancestors, or whatever, without saying anything. You can acknowledge your relationship to the divine with a searching gaze, and a listening ear. The act of laying out the offering, and of being present and attentive before the deity, becomes one’s statement. But somewhere, somehow, a spoken or written expression has to be part of the event: for if you cannot put your beliefs into words, it is possible to doubt that you believe anything at all. Hence why all religions have a text (and modern paganism has many texts!). I’m not the only, nor the first, person to consider whether there is a minimalist religion. Immanuel Kant, in typical Protestant zeal, thought that the core of a religion is its moral teachings, and so one could dispose of all the ritual elements and still be religious. Thus he would have kept the statement of “faith”, but dropped the representational image and the offering-receptacle. He starts with a similar question as myself, but reaches a different conclusion! Perhaps minimalist religion can go even more minimalist, by choosing any two of those three criteria and merging them into one. In Hinduism, for instance, the uttering of certain mantras serves as the statement of the significance of the spiritual principle, and at the same time the image of the spiritual principle itself. In Islam, the Kabbba is both the image representing one’s relationship to God and at the same time the receptacle to which one enacts that relationship through prayer. Exactly which two you see as really one may depend on which of these two propositions you prefer: that religion is something you do because of what you experience and/or believe, or that religion is something you experience and/or believe because of what you do. But these are only preliminary thoughts, and I may need to examine them more deeply over time. And so, friends, I invite your comments. – A three-pronged candlestick to which I have affixed some oak leaves, holly leaves, raven feathers, and a triskele carved from African rosewood (the latter was a gift from my first lover, almost 20 years ago). These are the three candles which illuminate every darkness: I’m sure the druids reading this text will understand me. – A copper cauldron, which is set before the candle stick, in which I sometimes pour a shot of wine or beer, although just as frequently I will go into the forest and make an offering of apples into a nearby lake. In that case, the lake serves as my ‘representational object’, and as my ‘receptacle of communication’, at the same time. The lake is important to me, for reasons I might describe some other day. “A spell to charm the life! 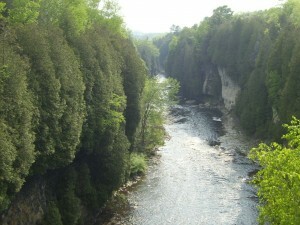 Photo: My first “cathedral”, the Elora Gorge, in the village where I grew up. My own photo, circa 2003. This entry was posted in General and tagged religion. Bookmark the permalink. I adore that prayer! Would you mind if I adopted it in my own practice? Loved this, I’m a minimalist myself; over more than 40 years I’ve stripped my Wicca and Druidy to the bones. “Minimalist Religion” … could be the next book. I have been reading a lot about Wicca and much of it is appealing. However, I have never been a “bells and smells” person and all of the ritual and all of the Stuff makes me uncomfortable. Can I be a pagan without all the pageantry? I think so. I’m not much interested in ritual these days either. It is enough for me to live by pagan values.